We hope you've enjoyed your 15 free articles this month. Subscribe today to gain FULL ACCESS to our online content. Partly cloudy this evening, then becoming cloudy after midnight. Low around 70F. Winds SSE at 10 to 20 mph.. Partly cloudy this evening, then becoming cloudy after midnight. Low around 70F. Winds SSE at 10 to 20 mph. Brunswick High’s Sheydan Baggs drives to the rim against Richmond Hill on Tuesday at Brunswick Square Garden. Brunswick High's Torrey Dickens dribbles against Richmond Hill on Tuesday at Brunswick Square Garden. Brunswick High’s Marquesia Heidt drives for a layup against Richmond Hill on Tuesday at Brunswick Square Garden. The final two seconds of the boys game between Brunswick and Richmond Hill made for as bizarre an ending as you’ll see on a basketball court. The Pirates were able to come out atop the madness to survive a ferocious late charge and down the Wildcats 48-47 on Tuesday at Brunswick Square Garden. Richmond Hill trailed by 11 entering the fourth quarter, but it managed to tie the game on a pair of free throws with 40 seconds remaining. After Brunswick briefly went back on top on a couple of Sheydan Baggs free throws, the visitors knotted the score again on a putback with just two seconds on the clock. In an attempt to quickly get the ball down the court for a shot, the Pirates immediately turned the ball over to give possession back to the Wildcats on their end of the court. While defending the ensuing inbounds play, a technical foul was called on Brunswick, giving Richmond Hill two free throws and possession. The Wildcats missed both free throws, and threw the ball out of bounds on the side out, giving the Pirates one last shot, and they made it count. Brunswick inbounded the ball to Torrey Dickens, who was fouled as he turned up court, giving him two shots at the victory. Dickens sank the first shot and intentionally missed the second to help his team secure the win. “That’s got to be the craziest game I’ve ever coached in,” Turner said. “We feel very fortunate to come away with that win. Brunswick (10-6, 3-0 Region 2-6A) used a 14-1 run to close out the second quarter to turn a four-point deficit into a nine-point advantage at halftime, and it looked as if it’d run away with the game when they went up 37-20 on Baggs’ basket midway through the third. But Richmond Hill (10-8, 2-1) refused to go away quietly, and despite entering the fourth down 40-29, it continued to chip away throughout the fourth as BHS went cold from the field. A drastic free throw disparity also helped the Wildcats trim points off the deficit as they got into the bonus and wound up shooting 16 free throws in the final period to just five for the Pirates. Over the balance of the game, Richmond Hill shot from the charity stripe 28 times compared to 10 by Brunswick. Joyful Hawkins finished with a team-high 14 points, and Baggs added 12 in the win. Brunswick head girls coach Maria Mangram expected her team to bounce back from a tough spell as it dove into region play and it did just that Tuesday against Richmond Hill. The Pirates stifled the Wildcats over an 11-and-a-half-minute stretch as they built a 12-point lead and hung on to score a 40-35 upset at Brunswick Square Garden. Richmond Hill (15-3, 1-1 Region 2-6A) entered the contest on a five-game winning streak, but it never led after briefly going up two late in the first quarter against Brunswick (7-8, 2-1), which had lost five of its last eight. “We needed that win bad,” Mangram said. “Also, hate to see a pattern, but it seems like we win, then we lose, then we win, then we lose. Brunswick scores seven straight after Richmond Hill’s opening basket, and after falling behind 9-7, the Pirates embarked on an 18-4 run to close the first half. The Wildcats clawed back into the contest, beginning with their first basket of the second half on a layup with four and a half minutes remaining in the third, and they drew to within two points at 34-32 on a corner 3 with 3:18 to play. 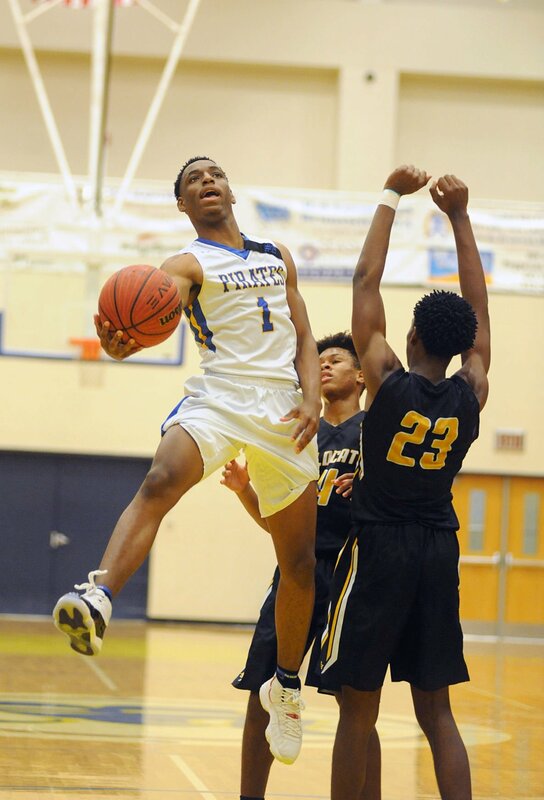 But Brunswick shook its third-quarter funk loose and made enough plays down the stretch to earn a big win against a region rival. Keya Daniels led the Pirate girls with 11 points, and Makaila Brown chipped in eight more. Shakardia Cowart had 11 points and seven steals in the win. Tyrease Jones and Jonathan Ellis each had six points in the loss. The Pirates picked a good time to play their best ball of the season. Coastal Georgia’s pitching allowed the team to claim the top spot in the conference and sweep USC Beaufort during the doubleheader on Wednesday. Fredrica Academy survived Trinity Christian’s first onslaught Tuesday but couldn’t find a way to come back after the Crusaders scored six more runs to put the Knights away for good 15-11. The Knights are the Region 2-3A champions again. Brunswick High and Glynn Academy have each had its share of problems in the field over the week prior to the series opener between crosstown rivals Monday at Wainwright Field. A standout defensive performance insured Frederica Academy got all the offense it would need to pick up a win over Trinity Christian in a two and a half minute stretch stretch of the first half Friday.